The patented topical and oral photoimmunoprotection with Polypodium Leucotomos Extract, Fernblock®, is worldwide under the name Heliocare® available. Because Heliocare® is available both for application to the skin (gel, make-up and spray) and as dietary supplements for oral use, our products protect from outside and inside against the UVA- and UVB-radiation. The photoimmunoprotective and antioxidative properties of Polypodium Leucotomos Extract are enhanced in the topical products (gel, make-up and spray) through the use of advanced physical and chemical filters. Because of the cosmetically elegant formulation they penetrate quickly and remain no oily or white film on the skin. 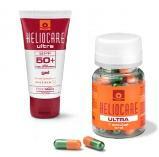 Heliocare® capsules contain Polypodium Leucotomos Extract and additional Vitamin D, Vitamin C and E, beta-carotene, green tea, as well as Lutein and Lycopin. Further information can be found in Germany under www.ifc-deutschland.com, in Austria under www.pelpharma.at , or click on the image below.